At last ........Hello, welcome and I hope anyone who is kind enough to drop by (after all the time that has elapsed since our last post) has had a wonderful Christmas spent in whatever way you enjoy the most. 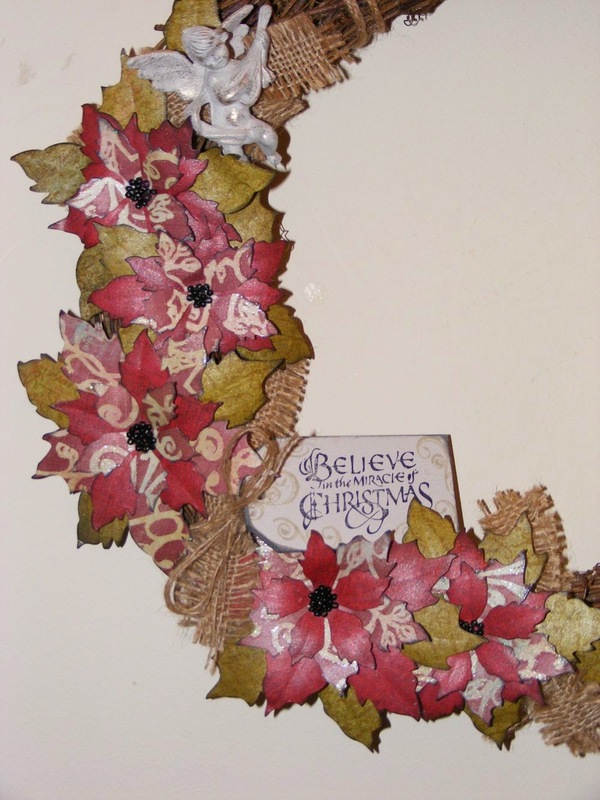 Way back when we were posting our last project Judith made the fab suggestion of making wreaths for our next one. I don't think any of us anticipated it would take us quite so long to get round to them but I actually managed to make mine by the end of November. My problem was finding time to take decent photos but I got there in the end and I have to say I'm really pleased with my first ever wreath. We didn't have to stick to a Christmas theme (and I don't know if my buddies decided to take a different route) but as it's my favourite time of year for decorations I'm glad I did as my wreath has been on display for several weeks now ;-). I totally forgot to take any photos of various stages so my apologies. There weren't any really complicated techniques though and I found this such a relaxing project to do. 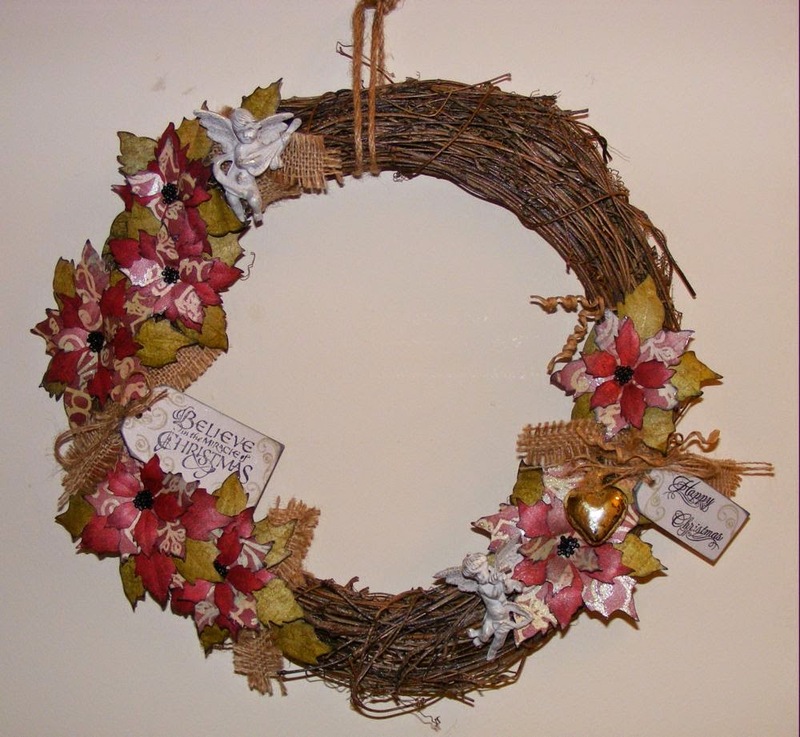 I bought the lovely rustic twig wreath from Hobbycraft and the two cute cherubs were just 25p each from my local supermarket. Originally they were a garish bright gold with awful glittered wings as you can see below but after a PaperArtsy Fresco Finish paint treatment and some touches of Treasure Gold paste they looked beautiful! and this was after and I liked them so much I went back a got a couple more, lol! I then plucked up courage to raid my stash of gorgeous Christmas papers, which I lovingly stroke every year but rarely use and put my Tim Holtz poinsettia die to hard work cutting out lots of flowers. I cut a few extra of the largest layer and cut them into individual 'leaves' to fill out my arrangement then inked the edges of every leaf and petal with Black Archival ink. I then shaped each one by using a round ended tool on the reverse before layering them to make the flowers. I used some black seed beads for the centres. I arranged them all on my wreath and adhered them with Liquitex heavy duty gel. I tied on some strips of hessian and some twists of paper covered wire which I also used to attach the vintage looking glass bauble. . Finally, I painted 2 small MDF tags with PaperArtsy FF, added some stamped scrolls, a sentiment and some hessian threads and attached them with the gel. I didn't tie them on because I wanted them to stay in position. 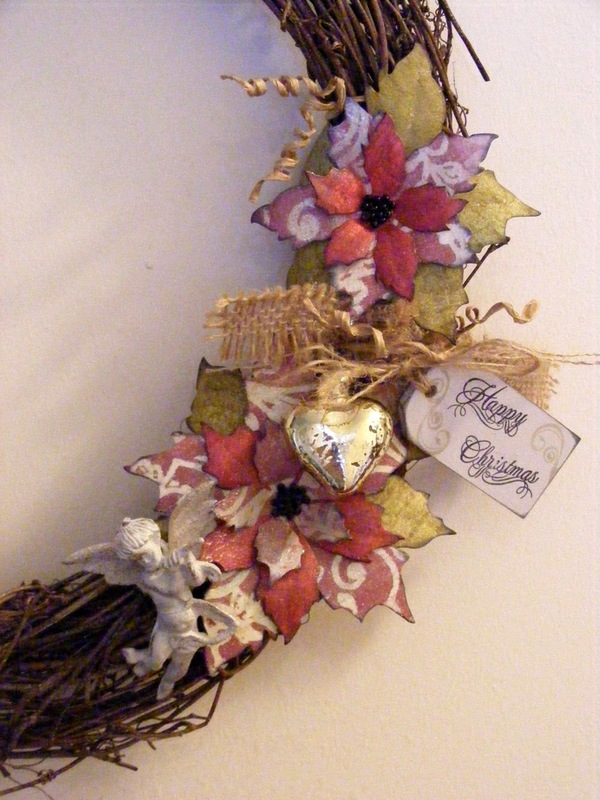 I used a piece of hessian cord which I'd saved from somewhere (as you do ;D) with which to hand my wreath. Ooh, nearly forgot, when everything was stuck down and dry I hung it outside and sprayed it with a Tattered Angels mica spray. I think it was Dewdrop but it was so long ago I'm not sure, lol! 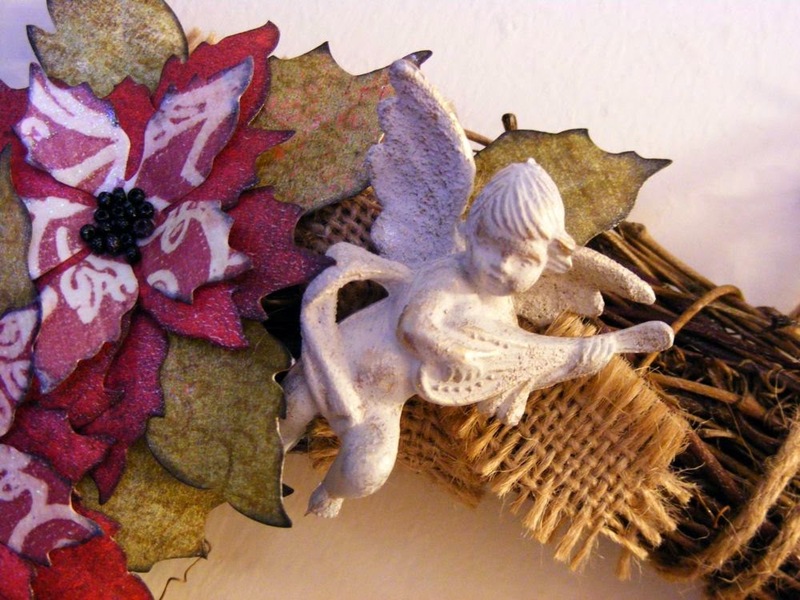 I think the subtle sparkle shows best on the close up of the cherub & flowers if you click one the pic. I hope you all enjoyed my little touch of Christmas decor and I'd like to take this opportunity of thanking you all for your visits, especially if you have time to leave a comment and for sticking with us through our infrequent blogging habits. We must try to do better in the new year! My good wishes to everyone and may 2015 bring you all happiness and good health. Wow what a super wreath Lesley, it must look fantastic up on the wall this Christmas. I love the beautiful flowers. Lesley, your wreath is stunning, really, really beautiful. I love the transformed cherubs, they look so much better now. 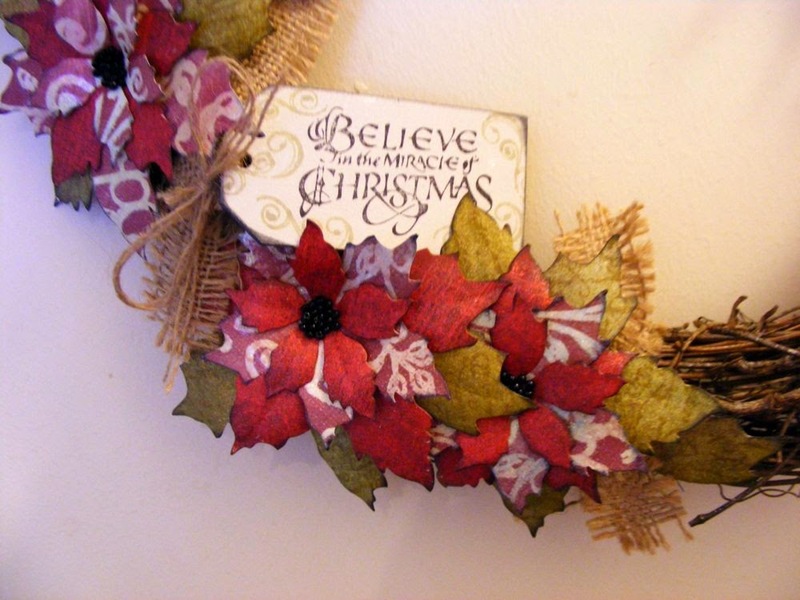 :) I want to do a wreath for next Christmas, so I'm adding this post to my Christmas Ideas Pinterest board to remind me. 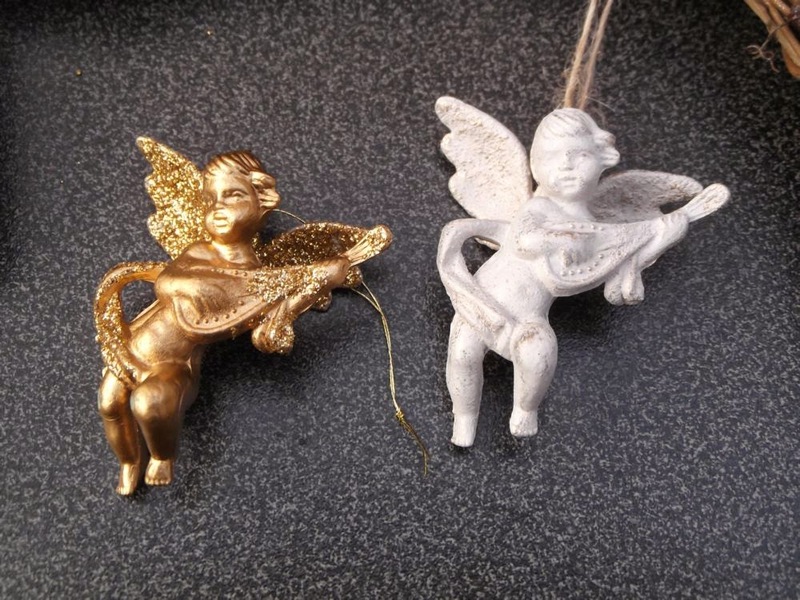 Love your altered cherubs - we have exactly those ones sitting amidst the Christmas decorations, and I've never liked them. I'm going to take inspiration from you next year and maybe they'll get an outing for once! Gorgeous festive wreath, Lesley - those poinsettias are fabulous. This is a beauty Lesley & I particularly like your additions of hessian to compliment the rustic twiggy wreath which acts perfectly as 'white space.' The balancing nature of your floral arrangements is a joy to see & I particularly like how your ornament on the smaller arrangement to the right makes that whole section heavier to balance the larger expanse of the left arrangements. Your little cherubs are truly transformed & I can see why you bought some more. It's a lovely touch to see the way the top one faces towards the bottom one & leads the eye to it.